Vienna, one of Europe's gourmet capitals for both food and wine, is home to many delicious local treats. With a local culinary scene that often rivals those of Paris or London all while seeming quaint and traditional, the city is a wonderful place to try some of the country's most distinctive dishes, sweets, and drinks. Locavores will especially appreciate the focus on fresh, locally sourced ingredients and excellent produce in many restaurants and eateries around town. What's more, as the former capital of the sprawling Habsburg Empire, the Austrian capital has also adopted specialties from around the world and made them their own. From schnitzel to mouthwatering cakes, sausages and hearty stews, these are the top 10 Austrian foods to try in Vienna. 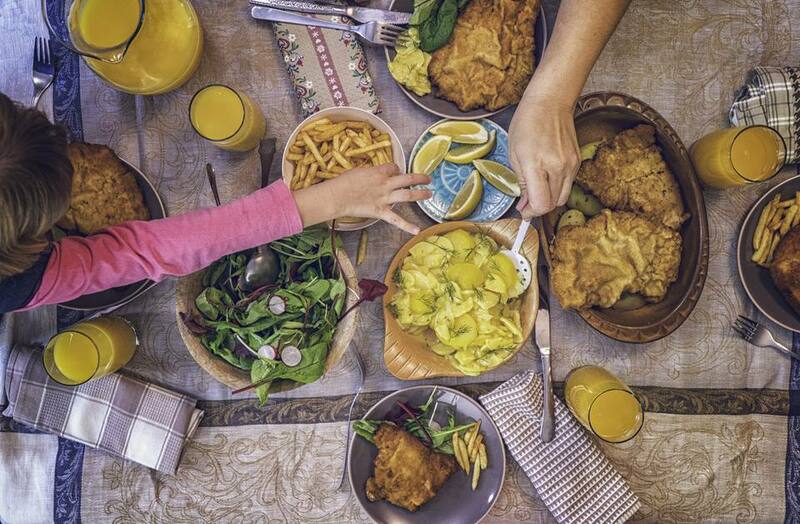 One of Austria's national dishes, Wiener Schnitzel is certainly its most successful export. Made from a thin cutlet of veal that's breaded and then pan-fried in butter or oil, schnitzel is cheerfully served in restaurants and eateries around the capital. Simple yet delicious, it's a huge crowd pleaser, and even kids tend to love it. Typically garnished with lemon and fresh parsley, it's often served with a simple salad with vinaigrette, Austrian potato salad (see more below), and steamed potatoes or French fries. A cold Austrian lager or glass of local Gruner Veltliner white wine makes an excellent accompaniment. Where to Try It: ​Figlmuller Wollzeile is a casual sit-down restaurant reputed as one Vienna's best spots for schnitzel and is located in the city center. Meanwhile, Schnitzelwurt serves some 15 varieties of schnitzel including pork, chicken and turkey. Finally, for vegetarians who wish to sample this most Austrian of dishes, Restaurant Landia (Ahornergasse 4) is coveted by non-meat eaters for their reputedly delicious veggie schnitzel. The Sachertorte is a proud symbol of the Austrian capital. It's a dense, chocolate sponge cake made with thin layers of apricot jam that's topped with a semi-firm chocolate icing. Where to Try It: This is the signature creation of the Sacher Hotel, an institution in the former Imperial city. But a rival bakery, Demel, also fashioned their own version of the beloved cake, using only a single rather than a double layer of marillemarmelade (Austrian for apricot jam). Dubbing their own cake the "Demel's Sachertorte," the confectionary sparked a legal dispute and enduring rivalry—one that locals and tourists thoroughly enjoy. Both cakes are delicious alongside a Viennese "melange" coffee (see below) or spicy black tea. This Hungarian import has become hugely popular in Vienna and around Austria, adapted locally to become its own distinctive dish. A hearty beef stew seasoned with tomatoes, onion, and paprika, the version you'll most likely taste in Vienna often includes Semmelknödel (dumplings). This is a dish that's perfect for a cold winter's day. Austrian goulash pairs well with a heartier beer or a glass of spicy, rich Zweigelt wine, one of Austria's rare reds. Where to Try It: If you're interested in sampling many different varieties of goulash, try dining at the Gulaschmuseum (Schulerstraße 20), not far from the Wien Mitte train station. Ilona Stuberl (Braunerstraße 2) is also reputed for its excellent goulash, as is Puerstner (Riemergasse 10). Even closer to the city center near the Albertina Museum, Cafe Mozart is also known to make a delicious version of this dish. Another Austrian delicacy loved around the world, the Apfelstrudel became popular around Eastern Europe under the influence of the Habsburg empire. Sold in bakeries, cafes, and restaurants around Vienna, this is a delicate counterpoint to the slightly heavier American apple pie. It's typically made with light, crisp pastry dough that's stretched and thinned, filled with apples, sugar, raisins, lemon, rum, cinnamon, and cloves. Often, the strudel is garnished with breadcrumbs mixed with nuts and dusted with powdered sugar. It's absolutely delicious accompanied with Viennese coffee or black tea. Strudels can also be found filled with other varieties of fruits, including berries and apricots. Where to Try It: Pop into any local bakery to find it. Many, especially those bakery-cafes with eating-in options, will even warm them up for you. Otherwise, try sitting in at local favorites such as Cafe Aida, with its retro-pink signage and 1950s-style interiors. Locations are scattered around the city. Kaffe Alt Wien (9 Bäckerstrasse), is also reputed for its delicious strudels. One local delight that we highly recommend trying if you're visiting in the spring is asparagus. Austria and Vienna offer some of the world's most delicious green and white asparagus, prepared in creative, fresh ways. Starting in late April or early May, menus at many local restaurants in Vienna start prominently featuring seasonal specials with Spargel. Sometimes, it's served simply with a bit of butter and lemon and doused in breadcrumbs; other times it's made into deliciously fresh soups or wrapped in prosciutto and slathered with hollandaise sauce. White asparagus, which is larger and thicker, is a particular favorite in the spring. Enjoy it with a side of parsley potatoes and a glass of crisp, equally fresh Gruner Veltliner wine. Some places even serve "Spargel" that's been fried in breadcrumbs, Schnitzel-style. In short, asparagus lovers will find no shortage of delicious ways to enjoy this seasonal treat. Quite different from its North American counterpart, there's no mayonnaise to be found in this fresh, healthy salad. Instead, it's prepared with white wine vinegar, a bit of mustard, red onions, chives, and a dash of salt and pepper. Some recipes also include a bit of chicken or meat stock, so if ordering as a vegetarian or vegan you may want to ask if the salad contains any meat products. This ubiquitous salad pairs beautifully with almost anything: schnitzel, sausages, fresh asparagus, or other seasonal vegetables. It's best enjoyed cold, although in the winter many restaurants serve it warm. Where to Try It: Like schnitzel, Erdäpfelsalat is pretty ubiquitous, and most full-service restaurants will offer it as a side dish. The aforementioned Figlmuller restaurant (Wollzeile 5) makes an especially delicious and fresh version of this salad, making it a great stop for trying both Wiener Schnitzel and potato salad. These delicious plum jam turnovers are about as Austrian as you can get. Difficult to find outside of Austria, Germany, and Eastern Europe, they originally hail from neighboring Bohemia (now the Czech Republic) but have become a staple in Austrian kitchens. The delicate pastries, made with a distinctive potato dough, are filled with a combination of plum jam, rum or plum schnapps, then topped with a mixture of breadcrumbs, butter, and walnuts. A bit of cinnamon and vanilla add aroma and a hint of spice. Some restaurants serve them with chocolate sauce or sugar. Where to Try It: Many of the traditional cafes and restaurants in Vienna serve this typical delicacy, and the Schick hotel is also well known for their own version. Some local bakeries also make their own versions as well. Another local specialty for meat lovers is Tafelspitz, a quintessentially Austrian dish made with tender filet of beef or veal gently boiled in broth. Typically served with seasonal vegetables or with applesauce and horseradish, this dish is enjoyed all across the country, especially in fall and winter. Accompanied by a good Austrian white or spicy red wine, Tafelspitz is a great alternative for those wishing to taste one of the country's national dishes but is looking for a healthier option. Where to Try It: Plachutta Wollzwille, a historic restaurant near the St-Stephens Cathedral, is well known for its version of this iconic dish. Restaurant Ofenloch has also received rave reviews from travelers for its Tafelspitz. Many other traditional restaurants in the city include it on their standard menus as well. Like Paris and Rome, Vienna is a European coffee capital. Cafes sprung up all around the city in the 18th through 20th centuries and have become fixtures of cultural and culinary life in the Austrian capital. The famed Viennese melange, similar to a cappuccino but usually without cocoa powder, is topped with half hot milk and half foamed milk. Cappuccinos in Austria are generally topped with whipped cream, rather than milk. If you're looking for an Americano, ask for a Verlängerter (literally, "longer"); plain coffee with cream is a Brauner, and an espresso or double espresso is referred to as a Schwartzer. Meanwhile, you can also enjoy local specialties with dramatic names: the Franziskaner (Franciscan Monk) is similar to a melange but is topped with whipped cream rather than foamed milk, while a Mozart is a true dessert in its own right: a double espresso served with a big mound of whip cream and served with a small glass of sherry. Where to Try It: Some of the best cafes in the capital to enjoy typical Viennese coffee and cake near the city center include Cafe Pruckel, Cafe Landtmann, Cafe Central, Cafe Hawelka, and Cafe Ritter. Simple yet renowned for their flavor, these sausages are traditionally made from both beef and pork, encased in sheeps' intestine. Served with sharp mustard, they are perfectly accompanied with Austrian potato salad, radishes, spring asparagus, and other fresh vegetables. Many people enjoy the simplicity and lower cost of procuring these goodies from street vendors, slathering them with mustard and gobbling them down right on the street. Whether in summer or winter, they make an excellent quick snack or simple meal (unless you're a vegetarian or vegan, that is). Where to Try It: In the city center, around the Ringstrasse and the old inner imperial city, there are numerous popular street vendors, or Wurstelstande, to choose from. Additionally, a fun place to wander and try out some local street food (including these ever-present sausages) is the Naschmarkt, a popular semi-permanent market where produce stands and casual restaurants serve a variety of goodies. In the summer, an afternoon out at the Prater, a sprawling, leafy park complete with a Ferris wheel, rides, and traditional food stands, is also a great spot to procure these.